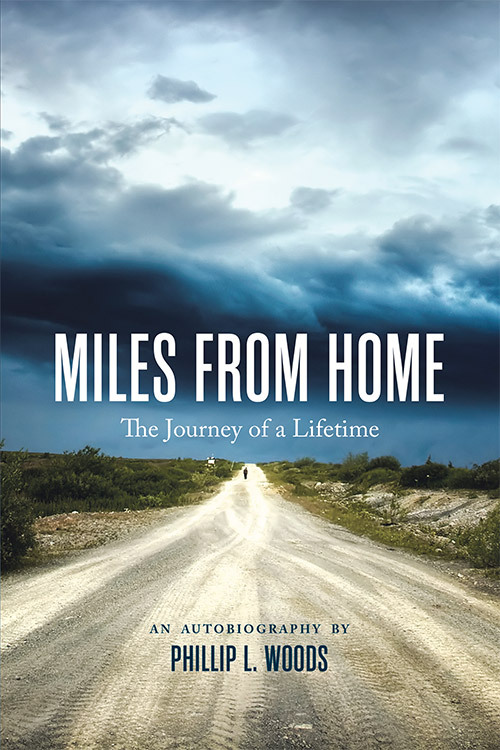 Miles From Home is a deeply personal story and a narrative of the American dream. Born to a devoted mother and severely alcoholic father, Phillip Lee Woods was sent as an 11 year old to live with a taciturn grandfather on a lonely farm in Indiana’s countryside. Doing backbreaking chores from daybreak to dark and walking a long, deserted road to catch the bus, Woods’ school years were marked by toil, embarrassment about his circumstances, and a yearning to reunite with his mother and sister. Living in an isolated farmhouse with no indoor plumbing, no phone, and little heat, Woods and his grandfather helped each other to survive. These challenging early experiences helped the young Woods become a determined, perseverant man. Woods started out as a postal clerk, and despite not having a college education, he went on to found his own successful insurance business, Woods & Grooms, Inc. Along the way, he married his favorite post office patron and had a family of his own. His climb to ultimate success was riddled with many failures, including near bankruptcies and unsuccessful forays into raising horses and running a flight school. But more than a story of the American dream – of a man who, like many, started with nothing and went on to achieve success and serve his community- this is a love story, not just between Woods and his wife of more than 50 years, but between Woods and America. At the age of 66, he decided to walk across the country from east to west, determined to see its roads again close up and meet its inhabitants in person. He wanted to see the country not as politicians and lobbyists were formulating it, but see it as a land of individuals who had their own values, their own opinions. In 2010, Woods again walked across the Unites States, from north to south, a testament to what a stout heart, a devoted wife, and a few good pairs of sneakers could accomplish. Copyright © 2015. Phillip L. Woods. All rights reserved.